I will restore your health and heal all your hurts. because they have called you an outcast, saying, It is Zion, whom no man seeks after. In this fallen orphan world that we live in, sickness is part of every day life. We all know someone who is struggling with some form of infirmity, or we ourselves may be struggling. When Jesus taught us to pray the Lord's Prayer, He said for us to ask our Father to bring His kingdom to this world. Since there is no sickness in heaven, we can receive comfort in knowing that healing is part of the good news of the gospel. 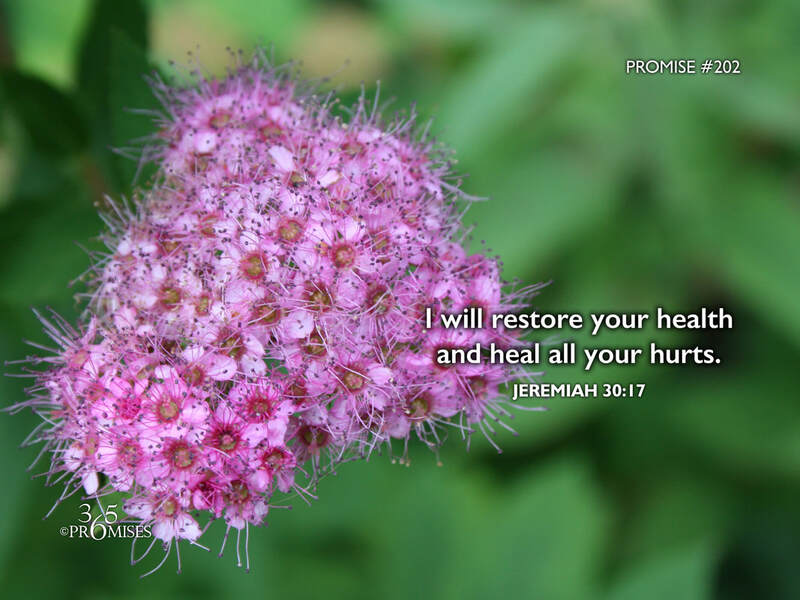 In today's promise, God promises to restore health to our bodies and to bring healing to all our wounds. How the fulfillment of that promise applies to us personally is as unique as each one of us is different. God's ways are not our ways and the fulfillment of this promise is tailored uniquely to our own circumstance. Personally, I have suffered partial deafness as a result of a childhood ear infection. I can't count the number of times that I have received prayer for healing. While the healing has not yet manifested itself, I still hold on to the promise that God is faithful and healing is part of the New Covenant, bought and paid for by Jesus Christ. Though there are times when I feel disappointment for not yet receiving my healing, I continue to open up my heart for more prayer. Sometimes that feeling of disappointment can open the door to disillusionment about healing. It is times like this that I need healing for the wounds of my soul. In Jeremiah 30:17, God promises to bring health to our bodies and healing to all the wounds we suffer in our heart. I pray that whatever your circumstance is today, that faith would rise up in your heart and you would believe God for the healing you need for both your body and your soul.